In the latest bombshell involving rumored diva Duchess Meghan Markle, it’s been reported that Prince William and wife Kate Middleton skipped a royal meeting due to their feud. According to The Sun, tongues are wagging after Wills, the brother of Markle’s husband Prince Harry, and Middleton failed to attend a board meeting of the Royal Foundation this week. And the latest moment in the rumored rivalry saw Harry and pregnant Markle attend the board meeting alone. A source revealed, “‘Not only were Harry and Meghan there, but they went to the staff Christmas party afterwards. “It was a very jolly affair. 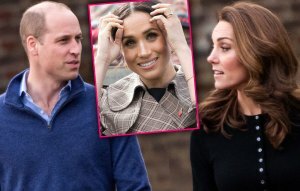 It’s a shame that William and Catherine did not turn up.” However, Kensington Palace has insisted that the Cambridges had not been expected because “their Royal Highnesses attend these meetings in turn,” a spokesman said. Still, another insider told The Sun that Harry is accusing William of trying to “wreck his relationship with Meghan.” William is believed to have “voiced concerns” about the former Suits star to his brother. Harry’s over-protectiveness of his wife has reportedly marred the brotherly relationship. One courtier told the British publication about Harry and his feelings after losing his mother Princess Diana, “It’s my opinion that Harry feels he couldn’t protect his mother, so he’s going all out to protect his wife. “This is his way of atoning. He will brook absolutely no criticism of Meghan — and he is so sensitive he often sees criticism or negativity where there isn’t any.” The talk of a feud has been fueled by the announcement that Harry, 34, and Markle, 37, are moving away from Kensington Palace to Frogmore Cottage. According to The Sun source, William tried to give his younger brother advice about the actress when the two were first dating. However, Harry “went mental” over the conversation, the insider has alleged, and the relationship between the two brothers has never really recovered since. Also, Markle tried to befriend Middleton but it didn’t work out well, according to the source. William’s wife is absorbed in raising children Louis, born in April, George, 5, and Charlotte, 3. Also, there are allegations that the Queen warned Harry about “difficult” Markle’s attitude after a dispute over what tiara she could wear on her wedding day. It was recently reported that sources said before she walked down the aisle at St. George’s Chapel at Windsor Castle in May, Markle requested air fresheners for the ancient venue! She was denied. Alarm bells also went off after Markle’s personal assistant resigned just six months into the job, according to the Daily Mail. Markle allegedly had brought the young woman to tears with her demands.